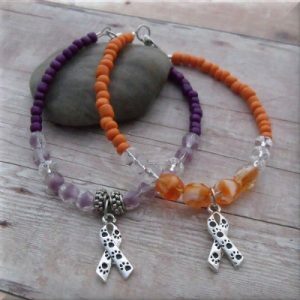 Purple & Orange Animal Awareness Bracelets Are Here! I know you love animals like I do because you’re here! 😉 If you’d like to have another way to show your love and support for all the sweet animals in the world, these ribbon bracelets are just for you. The silver ribbon charm is covered with adorable paw prints. What a beautiful way to show your love. Feel free to leave a comment. I’d love to hear from you! This entry was posted in Paw Blessings Jewelry and tagged animal lover, awareness bracelets, paw blessings jewelry.